We are proud to announce that our office building project in Warabi, Saitama (about 30min by train, from Ueno in central Tokyo) is nearing its completion . Yasuhiro Yamashita and his architecture studio Atelier TEKUTO have designed more than 200 urban micro-houses and compiled methods to make the most of limited space. Yamashita has applied his methods to this small office building. The chosen material was concrete because the site faced a boulevard with heavy traffic and the client requested a sturdy building that did not tremor every time a truck passed by. Another problem was the fragile land that used to be swamp land in ancient times. The weight of the building needed to be reduced. So Yamashita went a step further to strip the concrete structure to its bare minimum, exposing diagonal and intersecting beams and columns that we call a “muskmelon” or “skin of a cantaloupe” structure for its random looks. 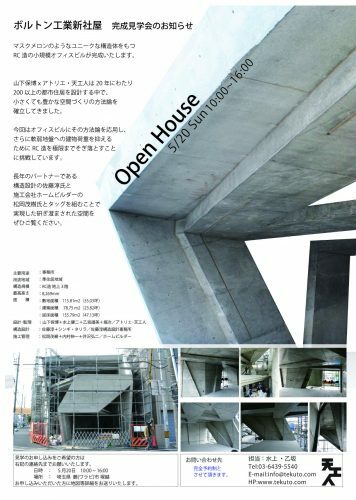 The dynamic structure of concrete columns and beams running diagonally was made possible by teamwork of Yamashita, structural engineer Jun Sato, and constructor Shigeki Matsuoka, the same team that created the acclaimed concrete residence, R・Torso・C.